RISHIKESH, INDIA - OCTOBER 11, 2014 : Unidentified people crossing Laxman Jhula footbridge on river Ganga by the Tera Manzil Temple. Indian people flock to Rishikesh for charity. hd00:30RISHIKESH, INDIA - OCTOBER 9, 2014 : Unidentified people crossing Laxman Jhula footbridge on river Ganga by the Tera Manzil Temple. Indian people flock to Rishikesh for charity. 4k00:13AJMER, INDIA - 30 OCTOBER 2014: People carry flowers into the Dargah shrine in Ajmer during Muharram. Dargah is an important place to visit for Sunni Muslims in India. hd00:39RISHIKESH, INDIA - OCTOBER 9, 2014 : Unidentified people crossing Laxman Jhula footbridge on river Ganga by the Tera Manzil Temple. 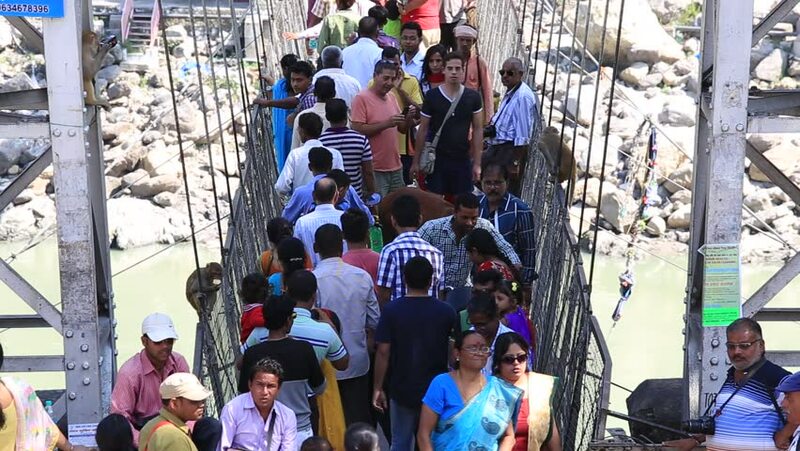 Indian people flock to Rishikesh for charity.